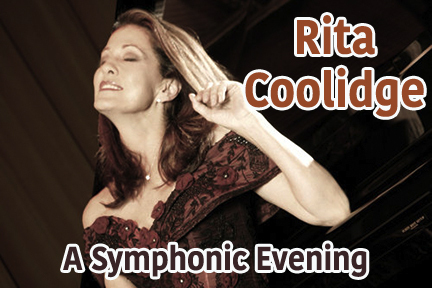 RITA COOLIDGE’S IMPACT IS UNDIMINISHED—HER VOICE AS PURE, SWEET AND POWERFUL AS EVER, AND HER ABILITY TO GET INSIDE A SONG HONED BY EXPERIENCE AND OVERVIEW. Rita’s credentials are the stuff of legend. After earning a degree in art at Florida State University, the Tennessee native decided to give music a shot before settling into a career as an art teacher. She moved to Memphis and was soon singing jingles, demos and background vocals for a number of area bands. Among them was a husband and wife duo, Delaney & Bonnie. When the pair signed their record deal, Rita suddenly found herself on big-time pop music’s leading edge. Her reputation as an A-list backup singer spread quickly. Joe Cocker enlisted her in that role and as a featured soloist on his Mad Dogs and Englishmen tour. (Rita performed a song she’d co-written, ″Superstar,″ which would later be a huge hit for The Carpenters.) Work with other rock royalty followed, including tours and recordings with Eric Clapton, Jimi Hendrix, Bob Dylan, Leon Russell and Stephen Stills. In 1971, A&M Records moguls Herb Alpert and Jerry Moss signed her to the label, and one of the most enduring solo careers in all of music was underway.